A cover up, dress, gladiator sandals or even a great bag are perfect accessories for that hot summer look. You can even find some great zebra jewelry if you choose to go with a more classic black swimsuit. Don't forget that this summer swimwear trend is all about posing: not so much for swimming but being the belle of the pool. Love these! Especially Leger and Zimmerman! Fab post! Fabulous!...almost good enough to wear to a cocktails! Lovely weekend 2U! 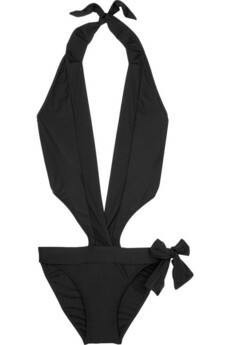 I adore these new swimsuits, but I can't work out whether I'd want those tan lines. Apparently there's a new style of suit which means you can tan through them, but I can't find them anywhere! I adore that first suit though. Thank you for the lovely comments dear bloggers!